"Bringing Up Even More Bates "
In Part One of its two-part finale for 2019, BRINGING UP BATES: Episode 814: Ready or Not, Baby Kade Is on His Way! shows the family celebrating the elder son’s birthday in the wilderness when their sister goes into labor with her baby, Kade. With its upbeat positive family message and Christian worldview, BRINGING UP BATES is great for the whole family. BRINGING UP BATES: Episode 814: Ready or Not, Baby Kade Is on His Way! changes pace when the elder Bates son turns 30. The Bates family plan a boys weekend getaway as the perfect cover for a 30th surprise party. Excitement mounts as all nine boys, plus their Dad Gil, make plans for a few days of muddy outdoor fun. After Kelly Jo does her mother role due diligence by warning the boys to be careful and safe, they hit the road. While the Bates boys are busy with their outdoor activities, the Bates girls sneak into their cabin to decorate for the surprise birthday party. As it turns out, Kelly Jo should have warned Dad to be careful, along with her children, since he’s the one who has a dangerous encounter out in the muddy wilderness. Then, the trip is unexpectedly cut short, when their sister Tori goes into labor. The crew takes a road trip in the middle of the night, with hopes they’ll be on time for the arrival of the new baby, Kade. With its upbeat positive family value message, BRINGING UP BATES is suitable and enjoyable for everyone. Though it lacks a little of the dramatic element, it’s light and relaxing to watch. The family prays together, they show care toward each other, and they genuinely have a good time. The parents, Gil and Kelly Jo, are wonderful role models. They respect and trust each other, and show it in their dialogue and planning for their family. The Christian and spiritually uplifting content makes BRINGING UP BATES suitable for the whole family. Miscellaneous Immorality: Nothing else objectionable. In BRINGING UP BATES: Episode 814: Ready or Not, Baby Kade Is on His Way! the oldest Bates son turns 30. 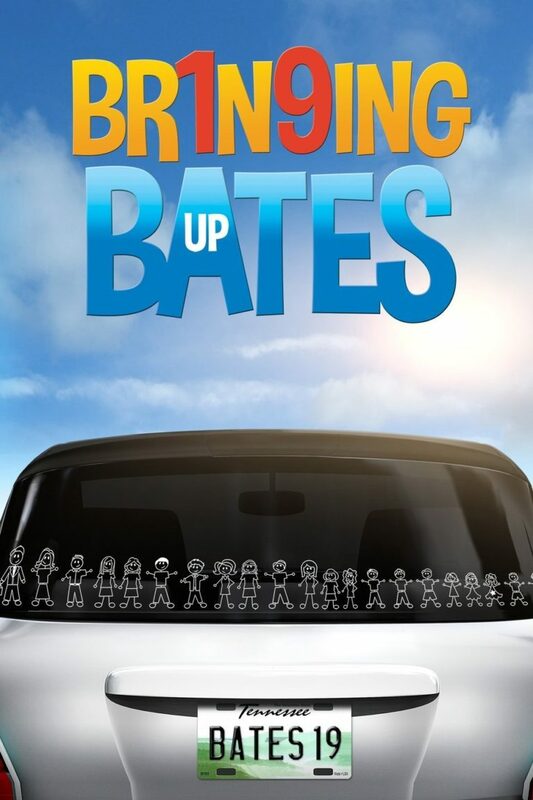 The Bates family plan a boys getaway as cover for a surprise party. All nine boys, plus their father, make plans for a few days of outdoor fun. While the boys enjoy outdoor activities, the girls decorate their cabin for the birthday party. As it turns out, Mother Kelly Jo should have warned Dad to be careful, along with her children, since he’s the one who has a dangerous encounter in the wilderness. The trip is cut short when their sister, Tori, goes into labor. With its upbeat positive family message, BRINGING UP BATES is suitable and enjoyable for everyone. Though it lacks a little of the dramatic element, it’s light and relaxing to watch. The family prays together, they show care toward each other, and they have a good time. The parents, Gil and Kelly Jo, are wonderful role models. They respect each other, and show it. The Christian, spiritually uplifting content makes BRINGING UP BATES great for the whole family.